What are you doing for the next 7000 years? Civilization V is more than just a turn-based civilization-builder: it’s a breathtakingly civilized turn-based civilization-builder, the sort of thing that begs to be enjoyed over a glass of Merlot in the drawing room, while bantering with the butler. The array of variables is as dense as ever – natural riches to identify, exploit and defend, food and cash reserves to nurture, competing despots to appease or annihilate – but the game is unfailingly considerate, accommodating in how those variables are detailed and displayed. On the one hand: the thrill of striking earth in the centuries before calendars existed, spading up walls and stamping down floors, sowing the first crops, pushing feelers into the surrounding black. On the other: the satisfaction of contemplating a well-organised, artfully compressed interface. On the one hand: mighty feats of engineering, bustling trade networks. On the other: a city management window that doesn’t make our retinas itch. Fonts are bigger, brighter, icons better distinguished. Tool-tips roll their tongues out obediently under lingering cursors. Snatches of ambient sound help differentiate menus. Dug-in soldiers sprout telltale gouts of yellow light. Advisors lean round the screen edge to dissect technologies, unit types or features as they’re discovered, proffering links to appropriate chapters in the almighty Civilopedia should you need a little more blurb. Orchestras ply the ear with classical medleys. 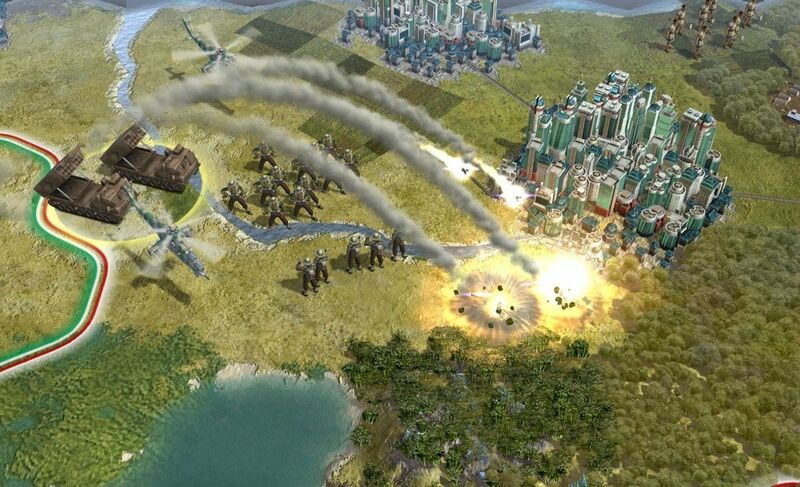 Visually, Civilization V's attractions lie more in cute quirks than technical beefiness. Does a game of this sort really need to push polygons? It’s another opportunity to rewrite humanity’s long climb from staircases to escalators, gradually divesting randomly generated worlds of their primordial darkness, stringing together a society from bright, succinct beads of history textbook. But for all that grand openness of intent, at the functional level Civilization V never leaves the slightest doubt about what to do next. Requests for troop or production orders, diplomatic missives, details of city growth and other minutiae are stacked atop a big unambiguous blue focus-the-camera button on the right. As long as that button doesn’t read “next turn”, there’s something left on your to-do list. 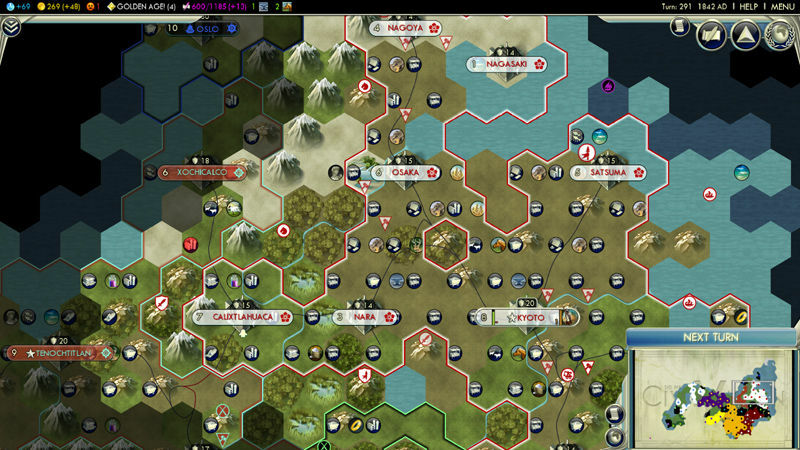 While the feature-set has put on weight after the militant prunings of Civilization: Revolution – there’s the option to speed up resource accrual or shrink the play area if the latter’s “short, sharp” three hour match lengths rubbed you the right way – this is one of the slimmer Civs, and not always to its credit. Civilization IV’s interesting civics and religion systems have been merged and kicked to the rear: highly generalised “Social Policies” like “Autocracy” and “Tradition”- empire power-up cards, in short, acquired at a glacial rate – can be implemented instead for cumulative global bonuses. War, however, is a lot more sophisticated, thanks to the presence of hex-based maps in place of the traditional checkerboard, and the linked decision to allow only one military unit per tile. Conflicts in Civs past tended to boil down to one player amassing an uncrackable tower of troop types from a host of eras, their individual traits blended into one all-conquering common denominator. Purged of stacks, the experience of playing Commander in Chief is a lot more graded, with greater emphasis on range, unlocked unit abilities and the lay of the land. The AI has a few new facets, too. Rival leaders are as capricious and frustratingly hard to read as before, for all the talked-about 25 “flavours” of behaviour, but in between them and the player are non-expansionist city-states, who can be wooed, ignored (risky) or beaten flat and annexed. Get a city-state on message by fulfilling its requests (or simply showering the ruler with gold), and it’ll treat you to luxury goods and free army refills; persuade it to become an ally, and touchy neighbouring empires will have something extra to worry about when they fling dirt at your door. As empires and their armies expand, the bare-bones strategic view proves its usefulness. The friction between these small-timers and the would-be globe-straddlers is what I like best about this new Civilization: they remind me a little of Left 4 Dead’s two tiers of threat, the Infected and Special Infected. More predictable, easier to manage but for that very reason a potential thorn in your side, city-states help variegate the business of all-out expansion and elimination the franchise has long perfected and, perhaps, exhausted. These are vital nuances, worthy of further tinkering, because there’s only so much a developer can achieve by filtering out the white noise, boiling down the hard-to-understand elements and building in more shortcuts. Though it pains me to take issue with transparency and ease of use, Civilization could stand a little untidiness in the name of pushing envelopes. 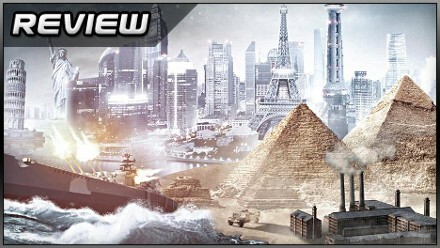 Firaxis has already done the whittling-down bit with Revolution, and to an extent Civ IV: time now for a shake-up. We’re often told that you can’t polish a turd, to pick an especially uncivil critical metaphor. Sounds about right – but past a certain point, you can’t polish a gemstone either. Still, none of that’s going to stop you losing sleep over the future of the German dye trade, or sketching out invasion plans on the bus to work, and once the AI’s charms begin to wane, there will be mods (the recently released tools look pretty substantial) and multiplayer rounds to fall back on. Highly refined and just a little faded, Civilization remains the classiest act in the “4X” marketplace. 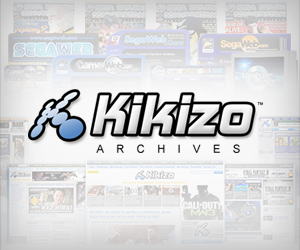 Posted in Reviews, Top 5, and tagged with 2K Games, Firaxis, PC. hello im known on PSN as Change Getter1 im very excited about civilization V BUT -_- im very much depressed that it isn’t on PS3 or XBOX PLEASE expand on PS3 & XBOX PLEASE expand on PS3 or at least make civilization revolution 2 with city-states, more units, world builder & more civilizationsplease im begging at the kneels for you to expand on PS3. thank you for your time. half white half black, 13 years alive ChangeGetter1 PSN. this is a add-on to my previous reply im an american boy who is sick of playing civilization revolution & easily beating it diety & watching my fellow PC gamers advances to civilization V as im stuck with revolution i yearn for another civilization game on PS3 you’d be surprised at how many mw2 players are attracted to civilization revolution oh 1 sec………..i have just got done counting i have beaten the game 17 times on chief (exact) 47 times on warlord (extremely close) 7 times on king ( estimate ) once on emperor (got cocky =D) & 5 times out of 14 won on diety (exact). im almost about to cry in despite hope that someone who knows or is a person who works on civilization to see this, “to tell sid his XBOX & PSN fans are dieing without their leader will we be a warlike people fighting noobs, newbies & Pros alike, they need you to guide them into the uncertain future of empires that is civilization! Sid Meier our people await your orders.”please don’t keep us waiting.